A while back, we wrote in these pixelated pages that the death of Research in Motion, the Canadian company that makes the BlackBerry, was fait accompli. 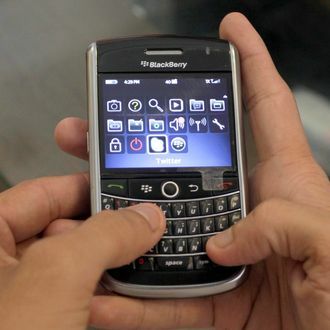 A massive influx of angry e-mails from BlackBerry fans immediately followed, as did a call from RIM’s corporate PR office, which insisted that we weren’t giving the company its due. BlackBerry 10, the much-delayed forthcoming OS upgrade, was going to be a hit with developers and carriers. And pretty soon, they insisted, the company’s revival would be apace, and we’d be eating our words. Today, as if to preempt another “dismal at best” earnings quarter with some good news, RIM gave the world an exclusive look at its new BlackBerry 10 technology, which is supposed to save the company from total failure. RIM was unable to show off the upcoming [Facebook] app in detail. First, the app crashed. Then it appeared the device stopped exporting the video signal to the external display. And then the app failed to update. Meanwhile, BlackBerry marketing manager Jeff Gadway sat down to give AllThingsD a preview of the new OS. It was, while better than the ill-fated Facebook app demo, not exactly heartening. (For some reason, it’s hard to picture RIM fans lining up around the block for a “BlackBerry Hub,” especially when Android phones have had similar unified in-box apps for years.) Neither does CEO Thorsten Heins’s enthusiasm for physical keyboards seem especially forward-thinking. But the clearest sign that the BlackBerry 10 launch is a Hindenburg in the making is the rank whiff of desperation coming from today’s BlackBerry 10 Jam developer conference. Witness Alec Saunders, a RIM marketing executive, “asking people to tweet out their reasons to believe in BB10 using the hashtag #bb10Believe,” according to Engadget. Or just press play on this video, debuted today, in which Saunders lip-synchs a love song to the tune of REO Speedwagon’s “Keep on Loving You,” essentially begging the platform’s developers not to abandon it. This, RIM fans, is what late-stage, irreversible corporate decline looks like.